Whether on the beach around a driftwood fire, at a backyard cookout or in a restaurant, chances are you'll encounter the traditional clambake during your stay in New England. The true clambake takes place on the beach, starting with the digging of the clams, but the backyard and restaurant versions are good substitutes provided you observe the rituals properly. — Fill a huge pot or kettle with clean seawater and place on the fire to boil. — Put live lobsters in the bottom, then a layer of seaweed, then ears of corn, more seaweed, and finally a layer of "steamers" (soft-shell clams for steaming). 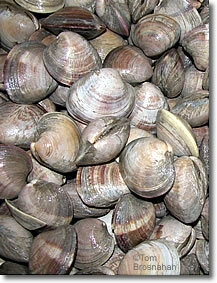 — When the clamshells open, the steamed clams are ready to eat. After you've had a dozen or so clams, move on to corn-on-the-cob with butter and salt. Finally, haul out the lobsters, bright red by now, and eat them mostly with your hands. Clean yourself up by taking a swim in the surf! It's impractical for most people to have a real New England beach clambake, but you can do it pretty well in any New England seafood restaurant. Order the New England clambake and you'll get steamers, corn-on-the-cob, and at least one lobster. Enjoy! 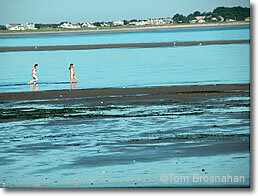 Below, the beach: the perfect place for a clambake...but difficult to do these days.